It's Friday night and I'm sat alone on the sofa in my leopard print onesie sipping amaretto and cranberry. The man has left me for a Friday 'lads night out' and I'm feeling lonely. My only comforts at the moment is the fluffy white rabbit that is nibbling everything in sight, the fact that Bridget Jone's Diary is on the television and the fact that I can cheer myself up by a bit of online shopping....he shouldn't have left me alone with my credit card (jokes...or maybe i'm serious). When I get bored and have nothing to do, I resort to being one of those people that does virtual online shopping. The ones that shove everything they see into an online shopping basket and then sulks when they can't afford everything. Then comes the task of withdrawing each item one by one until you're left with a less fulfilling one item in the basket, that the majority of the time you never really wanted in the first place. Finally you realise, to have got to that point you must have had far too much time on your hands and looking at the clock, you realise that you have wasted far too many hours doing pointless little things. 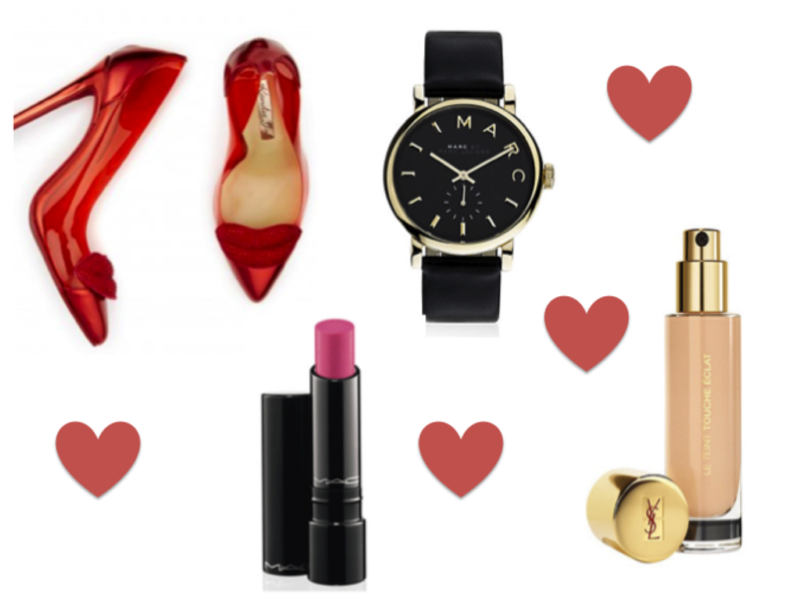 To make my shopping wish lists seem a little less pointless, I thought I would create my 'Friday Night Wish list' and see what your thoughts are on the items that I am trying to resist buying. The first item on my Friday Night Wish List are these beautiful Kandee Cherry Lip shoes (link). They look quirky, yet sophisticated and I love the see through edge. In fact, I'm highly tempted to buy a pair of these for my wedding day. My dress has a long train and I'm looking for a pair of quirky shoes I can show off in the wedding photographs. Kandee have always been one of my favourite shoe brands - let's face, what girl does not like sweeties and shoes? It's a match made in heaven. Second item on my wish list is this gorgeous Marc by Marc Jacobs watch from Harrods (link). I was lured onto the Harrods site when I noticed that they are having a 10% off weekend and couldn't wait to see what bargains they had. I'm usually a big Michael Kors fan when it comes to watches, but recently I've been looking for something a little less subtle to wear. I'd like to buy another watch so I have more day to day options and this Marc Jacobs watch has a timeless look that can fit easily with most of the items in my wardrobe. It's something that I might have to save until next payday, but hopefully this watch will soon be mine. Third item is the Touche Eclat YSL foundation (link). I've heard so many amazing things about this foundation and I've always wanted to try it for myself. Apparently it is pretty good for coverage and gives a dewy, youthful glow - all the things I look for in a foundation. I know that Illamasqua Skin Base is one of my all time favourites, but lately I'm feeling experimental. I will never stop searching for the 'Holy Grail' foundation. My final wish list item is a new MAC lipstick. It has been awhile since I have shopped at MAC because I don't have one in my hometown and I usually like to try before I buy. Now that I work in the city, I have plenty of time to go exploring and I love the colours in the new Sheer Supreme Moody Blooms collection. Have you been tempted to buy anything lately? I do this too! Except, usually I fall asleep without removing the items and can't understand why I have emails the next day saying 'you left something in your basket'! This is not just virtual shopping for me, it's also virtual wearing, as I would never get away with those shoes, although they look fab! I have that foundation! It's quite nice actually, skin looks softer once applied! I'd like to try the foundation here but I'm nowhere near the end of my present foundation. Recently I bought a couple of clutch bags on ebay!